Alternative energy is a term for any nontraditional energy form, source, or technology differing from the current popular forms, sources, or technologies. Today, it is generally used in the context of an alternative to energy deriving from popular fossil fuels and thus includes energy derived from such environmentally preferred sources as solar, water power, biomass, wind, geothermal, ocean thermal, wave action, and tidal action. The term alternative energy also is used for energy derived from sources and technologies that do not involve the depletion of natural resources or significant harm to the environment. As such, it is used synonymously with "renewable energy" and "green power." While by most definitions there is substantial overlap between energy forms, sources, and technologies that fit into these three categories, and alternative energy often is applied to energy without undesirable environmental consequences or with lessened environmental impact, the three terms also have been delineated differently. Renewable energy generally refers most specifically to energy derived from sustainable natural resources that are constantly replenished within a relatively short time frame (such as deriving from such renewable natural resources as biomass, sunlight, wind, water, and so forth), while "green power" references that subset of renewable energy that involves the least environmental harm. As delineated in the first paragraph, before natural gas gained popularity, this energy source could be classified under the category of alternative energy, but not that of renewable energy. Developing alternative energy sources offers the potential to meet humanity's development needs but in a way that considers also the protection of the environment. As such, it integrates with the goal of sustainable development. There are a multitude of definitions used for alternative energy (see table below for common examples). Other definitions abound. Smith and Taylor (2008), in their book Renewable and Alternative Energy Resources, define alternative energy technologies as "those that are not derived from fossils fuels but that also are considered nonrenewable" with renewable energy technologies as those that harness energy from an inexhaustible source" (sun, wind, waves, biomass, falling water, heat generated beneath the surface of the earth). U.S. Environmental Protection Agency Energy derived from nontraditional sources (e.g., compressed natural gas, solar, hydroelectric, wind). Intergovernmental Panel on Climate Change (IPCC) Third Assessment Report Energy derived from non-fossil fuel sources. Collins English Dictionary Also called: renewable energy. A form of energy derived from a natural source, such as the sun, wind, tides, or waves. Random House Dictionary Energy, as solar, wind, or nuclear energy, that can replace or supplement traditional fossil-fuel sources, as coal, oil, and natural gas. Many definitions of alternative energy, as noted above, use this term interchangeably with renewable energy. The US Environmental Protection Agency (2014) defines renewable energy as "Energy resources that are naturally replenishing such as biomass, hydro, geothermal, solar, wind, ocean thermal, wave action, and tidal action." The EPA's Green Power Partnership (2013) defines the term as "renewable energy includes resources that rely on fuel sources that restore themselves over short periods of time and do not diminish." The Intergovernmental Panel on Climate Change (2001) defines renewables as "energy sources that are, within a short timeframe relative to the earth’s natural cycles, sustainable, and include non-carbon technologies such as solar energy, hydropower, and wind, as well as carbon neutral technologies such as biomass." Part of the 354 MW SEGS solar complex in northern San Bernadino County, California. About half the incoming solar energy reaches the Earth's surface. Broadly speaking, solar energy is energy from the Sun. About 174 petawatts (PW 1015 watts) of solar radiation reaches the Earth's atmosphere every year (Smil 1991). Approximately 30% is reflected back to space while the rest is absorbed by clouds, oceans, and land masses(for about 3,850,000 exajoules (EJ) per year (Smil 2006)), with roughly 50% reaching the surface of the Earth. Overall, the energy in sunlight yields about 1000 watts per square meter on a cloudless day at noon, and averaged over the entire Earth's surface each square meter collects about 4.2 kilowatt-hours of energy every day. This light can be changed into thermal (heat) energy and converted by photosynthesis into chemical energy that can be used to fuel organisms' activities. This solar energy drives climate and the weather and supports virtually all life on Earth. In terms of alternative energy, solar energy refers to the energy that is harnessed from solar radiation, using the radiant light and heat from the Sun for practical purposes. The term solar power either is used synonymously with solar energy or is used more specifically to refer to the conversion of sunlight into electricity. Solar energy can be harnessed at different levels around the world, mostly depending on distance from the equator. 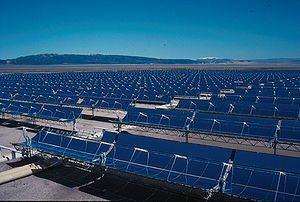 In actuality, almost all renewable energies, notably excluding geothermal and tidal, derive their energy from the sun. For example, winds blow partly because of absorption of solar radiation by the Earth's atmosphere. Even non-renewable energy sources such as coal, gas, and oil involve the storing of energy from sunlight preserved under the Earth's crust. Among solar-based renewable resources, wind and wave power, hydroelectricity, and biomass account for over 99.9 percent of the available flow of renewable energy (Smil 2006; Scheer 2002). Solar energy radiant light and heat from the sun is harnessed using a range of ever-evolving technologies such as solar heating, solar photovoltaics, solar thermal electricity, solar architecture, and artificial photosynthesis (IEA 2011; RSC 2014). Technologies to harness the sun's energy date from the time of the early Greeks, Indian, Native Americans, and Chinese, who warmed their buildings by orienting them toward the sun (Butti and Perlin 1981). British astronomer John Herschel used a solar thermal collector box during an expedition to Africa to cook food (EIA 2017). Modern solar technologies provide heating, lighting, electricity and even flight (USDOE). There are many technologies for harnessing solar energy within these broad classifications: active, passive, direct and indirect. Active solar systems use electrical and mechanical components such as tracking mechanisms, pumps, and fans to capture sunlight and process it into usable outputs such as heating, lighting or electricity. Passive solar systems use non-mechanical techniques to control the capture of sunlight and distribute this energy into usable outputs such as heating, lighting, cooling, or ventilation. These techniques include selecting materials with favorable thermal properties to absorb and retain energy, designing spaces that naturally circulate air to transfer energy and referencing the position of a building to the sun to enhance energy capture. In some cases passive solar devices can have mechanical movement with the important distinction that this movement is automatic and directly powered by the sun. Direct solar generally refers to technologies or effects that involve a single-step conversion of sunlight that results in a usable form of energy. Indirect solar generally refers to technologies or effects that involve multiple-step transformations of sunlight that result in a usable form of energy. The collecting of solar radiation and converting it into electricity—the production of solar power—can be done in two ways: (1) directly using photovoltaics (PV devices) or "solar cells"; or (2) indirectly using solar thermal/electric power plants. The first method involves grouping individual PV cells into panels and arraying panels, ranging from small cells to power watches and calculators to those that power single homes to those that produce electricity in power plants covering many acres. The second way uses concentrated solar power (CSP), whereby lenses or mirrors to concentrate a large area of sunlight, or solar thermal energy, onto a small area. Electrical power is produced when the concentrated light is converted to heat, which drives a heat engine (usually a steam turbine) connected to an electrical power generator or powers a thermochemical reaction. In 2012, there were 12 such power plants in the United States (EIA 2017). Benefits of solar energy system include the huge potential in terms of energy hitting the earth, the low environmental impact, and the lack of producing carbon dioxide and air pollutants. Limitations preventing the large scale implementation of solar powered energy generation is the inefficiency of current solar technology and the cost. In addition, the amount of sunlight varies depending on weather conditions, location, time of day, and time of year, and the need for a large surface to collect the energy, since it does not deliver concentrated energy at any one place (IEA 2014). Generally speaking, wind energy is the form of energy created by wind. Wind, the flow of air on a large scale, is caused by differences in atmospheric pressure. When a difference in atmospheric pressure exists, air moves from the higher to the lower pressure area, resulting in winds of various speeds. 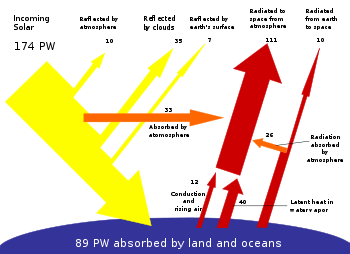 Globally, the two major driving factors of large-scale wind patterns (the atmospheric circulation) are the differential heating between the equator and the poles (difference in absorption of solar energy leading to buoyancy forces) and the rotation of the planet. In terms of alternative energy, wind energy refers to the energy that is harnessed from wind for practical purposes. The term wind power is used synonymously as the conversion of wind energy into a useful form of energy, or more specifically as the generation of electricity from the wind. Among ways in which wind energy can be harnessed are wind turbines to make electrical power, windmills for mechanical power, windpumps for water pumping or drainage, or sails to propel ships. 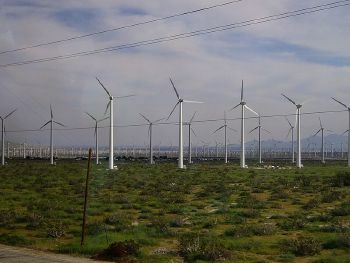 Large wind farms consist of hundreds of individual wind turbines that are connected to the electric power transmission network. For new constructions, onshore wind is an relative inexpensive source of electricity, while small onshore wind farms provide electricity to isolated locations. Utility companies increasingly buy surplus electricity produced by small domestic wind turbines. Offshore wind is steadier and stronger than on land, and offshore farms have less visual impact, but construction and maintenance costs are considerably higher. Floating wind farms are similar to a regular wind farm, but the difference is that they float in the middle of the ocean. Offshore wind farms can be placed in water up to 40 meters (130 ft) deep, whereas floating wind turbines can float in water up to 700 meters (2,300 ft) deep (Horton 2008). The advantage of having a floating wind farm is to be able to harness the winds from the open ocean. Without any obstructions such as hills, trees, and buildings, winds from the open ocean can reach up to speeds twice as fast as coastal areas. Nighttime wind power is considered the most economical form of electrical power with which to synthesize fuel, because the load curve for electricity peaks sharply during the warmest hours of the day, but wind tends to blow slightly more at night than during the day, so, the price of nighttime wind power is often much less expensive than any alternative (Pearson 2012). Wind power offers a number of benefits as an alternative to fossil fuels. It is plentiful, renewable, widely distributed, clean, produces no greenhouse gas emissions during operation, and uses little land. The effects on the environment are generally less problematic than those from other power sources. Costs are relatively low and once the infrastructure is paid for it is virtually free (Siegel 2012). The main disadvantage of wind power is the fact that wind is unpredictable, inconsistent, and unsteady, as well as the concern that the full costs of harnessing wind power are not cheap and thus rely on government subsidies to be set up and be competitive. There also are aesthetic concerns, with wind farms being considered by some to be an eyesore, whether restricting the normally picturesque view offshore or in rural areas. Furthermore, there are complaints of noise from turbines, and some communities have been required to shut off their turbines during certain times because of the noise. Older type wind farms have turbines that spin at high speeds and can thus kill wild birds and bats, although this design has changed so newer wind farms largely avoid such a problem (Siegel 2012). Windpower, if deployed on the large scale necessary to substitute by itself for fossil energy, is likely to face public resistance. If 100% of U.S. energy demand were to be supplied by windmills, about 80 million hectares (i.e., more than 40% of all available farmland in the United States) would have to be covered with large windmills (50m hub height and 250 to 500 m apart) ((Elliott et al. 1992).It is therefore not surprising that the major environmental impact of wind power is related to land use and less to wildlife (birds, bats, etc.) mortality. Unless only a relatively small fraction of electricity is generated by windmills in remote locations, it is unlikely that the public will tolerate large windfarms given concerns about blade noise and aesthetics (Elliott 1997). As of 2011, Denmark is generating more than a quarter of its electricity from wind and 83 countries around the world are using wind power to supply the electricity grid (Sawin et al. 2011). In 2010 wind energy production was over 2.5% of total worldwide electricity usage, and growing rapidly at more than 25% per annum. In general terms, geothermal energy is thermal energy (the energy that determines the temperature of matter) generated and stored in the Earth. The geothermal energy of the Earth's crust originates from the original formation of the planet (20%) and from radioactive decay of minerals (80%). The geothermal gradient, which is the difference in temperature between the core of the planet and its surface, drives a continuous conduction of thermal energy in the form of heat from the core to the surface. In terms of alternative energy, geothermal energy is the use of the Earth's internal heat for practical purposes and in particular to boil water for heating buildings or generating electricity. Geothermal energy is produced by tapping into the thermal energy created and stored within the earth. It is considered sustainable because that thermal energy is constantly replenished (Ryback 2007). However, the science of geothermal energy generation is still young and developing economic viability. Several entities, such as the National Renewable Energy Laboratory and Sandia National Laboratories, conduct research toward the goal of establishing a proven science around geothermal energy. The International Centre for Geothermal Research (IGC), a German geosciences research organization, is largely focused on geothermal energy development research. 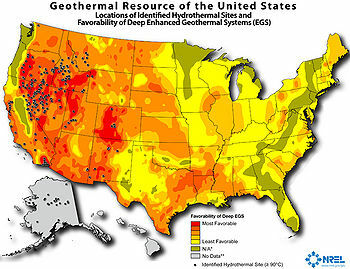 In the United States, geothermal is one of the renewable energy resources used to produce electricity, but its growth is slower than that of wind and solar energy development and a November 2011 report noted that it produced just 0.4% of the electricity from all sectors nationally during the first 8 months of that year, with 10,898 million kilowatthours (kWh) produced during that time. However, about 5% of the electricity generated in California was produced from geothermal, although there are significant geothermal resources that could be utilized (EIA 2011). Geothermal thermal energy is used to generate electricity typically via a well that is drilled into an underground reservoir of water that can be as hot as 371 degrees Celsius (700 Fahrenheit). At the surface, a turbine is turned using the trapped steam. Heat pumps are used to move fluids through pipelines buried underground at depths where the temperature does not change much and delivered to a home or commercial building. During the summer, this pipeline can pull heat out of a building and uses cooler fluid to cool the building. Geothermal water also is found in geysers or hot springs on the Earth's surface (EIA 2011). Geothermal provides a clear, sustainable, environmentally friendly and substantial resource. However, it also faces challenges in that geothermal plants generally are site-specific and limited to regions with accessible deposits of high temperature ground water, the completing of a geothermal plant takes significant time (four to eight years) versus the times for wind or solar, and there is a lack of transmission lines (EIA 2011). The 22,500 MW Three Gorges Dam in the Peoples Republic of China, the largest hydroelectric power station in the world. The energy of falling water and running water can be utilized to provide water power or hydropower—the form of renewable energy derived from the gravitational force of falling or flowing water harnessed for useful purposes. Since ancient times, hydropower has been used for irrigation and the operation of various mechanical devices, such as watermills, sawmills, textile mills, dock cranes, domestic lifts, and power houses. Since the early twentieth century, the term hydropower has been used almost exclusively in conjunction with the modern development of hydroelectric power, which allowed use of distant energy sources. Hydroelectricity is the term referring to electricity generated by hydropower; the production of electrical power through the use of the gravitational force of falling or flowing water. Another method used to transmit energy involves a trompe: a water-powered gas compressor, commonly used before the advent of the electric-powered compressor, which is somewhat like an airlift pump working in reverse. A trompe produces compressed air from falling water. Compressed air could then be piped to power other machinery at a distance from the waterfall. Hydroelectricity today is the most widely used form of renewable energy (unless all biomass categories, such as wood and biofuels, are lumped together), accounting for 16 percent of global electricity generation—3,427 terawatt-hours of electricity production in 2010. 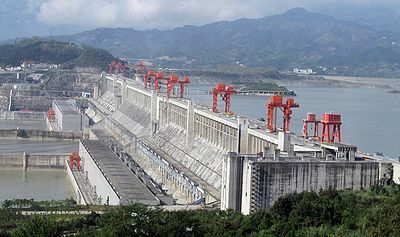 China is the largest hydropower producer, producing 721 terawatt-hours in 2010 and having the highest installed hydropower capacity, with 213 gigawatts (GW) at the end of 2010. Hydropower is produced in at least 150 countries, with five countries (China, Brazil, United States, Canada, and Russia) accounting for about 52 percent of the world’s installed hydropower capacity in 2010 (Worldwatch 2013). The Three Gorges Dam, spanning China's Yangtze River, is the world's largest hydroelectric power station in terms of installed capacity. The cost of hydroelectricity is relatively low, making it a competitive source of renewable electricity. The average cost of electricity from a hydro plant larger than 10 megawatts is 3 to 5 U.S. cents per kilowatt-hour (Worldwatch 2013). Hydro is also a flexible source of electricity since plants can be ramped up and down very quickly to adapt to changing energy demands. Once a hydroelectric complex is constructed, the project produces no direct waste, and has a considerably lower output level of the greenhouse gas carbon dioxide (CO2) than fossil fuel powered energy plants (Sawin et al. 2011). However, damming interrupts the flow of rivers and can harm local ecosystems, and building large dams and reservoirs often involves displacing people and wildlife. Given such concerns, in some nations building new dams on major rivers to capture hydroelectric energy meets a lot of resistance and further expansion of hydropower in the United States is unlikely. On the other hand, China's Three Gorges Dam became fully functional in just 2012. Biomass refers to biological material derived from living or recently living organisms, such as plants or plant-derived materials. As an energy source, biomass can either be used directly via combustion to produce heat, or indirectly after converting it to various forms of biofuel. Conversion of biomass to biofuel can be achieved by different methods, which are broadly classified into: thermal, chemical, and biochemical methods. This biomass conversion can result in fuel in solid, liquid, or gas form. Biofuel, wood, and waste are the three main categories of the use of biomass as an energy source. The generation of alternative energy from biomass on the scale needed to replace fossil energy would present serious environmental challenges. For example, biomass energy generation would have to increase 7-fold to supply current primary energy demand, and up to 40-fold by 2100 given economic and energy growth projections (Huesemann and Huesemann 2011). Humans already appropriate 30 to 40% of all photosynthetically fixed carbon worldwide, indicating that expansion of additional biomass harvesting is likely to stress ecosystems, in some cases precipitating collapse and extinction of animal species that have been deprived of vital food sources (Rojstaczer et al. 2001; Vitousek et al. 1986). The total amount of energy capture by vegetation in the United States each year is around 58 quads (61.5 EJ), about half of which is already harvested as agricultural crops and forest products. The remaining biomass is needed to maintain ecosystem functions and diversity (Pimentel et al. 1994). Since annual energy use in the United States is ca. 100 quads, biomass energy could supply only a very small fraction. To supply the current worldwide energy demand solely with biomass would require more than 10% of the Earth’s land surface, which is comparable to the area use for all of world agriculture (i.e., ca. 1500 million hectares), indicating that further expansion of biomass energy generation will be difficult without precipitating an ethical conflict, given current world hunger statistics, over growing plants for biofuel versus food (Hoffert et al. 2002; Nakicenovic et al. 1998). Of course, developing productive means to produce energy from the parts of vegetation not utilized in food production, such as discarded, inedible cellulose components, would help address some of these difficulties. A biofuel is a solid, liquid, or gaseous fuel (a material that stores potential energy in forms that can be practicably released and used as heat energy) made from biomass. In other words, these fuels contain energy from geologically recent carbon fixation of living or recently living organisms. Examples of this carbon fixation occur in plants and microalgae. As noted by Wilkie (2013), "Any combustible fuel derived from recent (non-fossil) living matter (biomass) may be considered a biofuel, including ethanol derived from plant products, biodiesel from plant or animal oils, as well as, biogas from biomass. Biofuels are a subset of renewable energy, as with solar, wind, hydro, and geothermal. Biofuels have increased in popularity because of rising oil prices and the need for energy security. In 2010, worldwide biofuel production reached 105 billion liters (28 billion gallons US), up 17% from 2009 (Worldwatch 2011). Global ethanol fuel production reached 86 billion liters (23 billion gallons US) in 2010, with the United States and Brazil as the world's top producers, accounting together for 90% of global production. The world's largest biodiesel producer is the European Union, accounting for 53% of all biodiesel production in 2010 (Worldwatch 2011). Biologically produced alcohols, most commonly ethanol, and less commonly propanol and butanol, are produced by the action of microorganisms and enzymes through the fermentation of sugars or starches (easiest), or cellulose (which is more difficult). Alcohol fuels are produced by fermentation of sugars derived from wheat, corn, sugar beets, sugar cane, molasses, and any sugar or starch from which alcoholic beverages can be made (such as potato and fruit waste, etc.). These alcohols are also produced by chemical means. When obtained from biological materials and/or biological processes, they are known as bioalcohols (e.g. "bioethanol"). There is no chemical difference between biologically produced and chemically produced alcohols. Bioethanol. Ethanol fuel, or bioethanol, is the most common biofuel worldwide, particularly in Brazil, but also in the United States and elsewhere. The ethanol production methods used are enzyme digestion (to release sugars from stored starches), fermentation of the sugars, distillation, and drying. Ethanol is produced mostly from carbohydrates produced in sugar or starch crops such as corn or sugar cane. The distillation process requires significant energy input for heat (often unsustainable natural gas fossil fuel, but cellulosic biomass such as bagasse, the waste left after sugar cane is pressed to extract its juice, can also be used more sustainably). Ethanol can be used as a fuel for vehicles in its pure form, but it is usually used as a gasoline additive to increase octane and improve vehicle emissions. Cellulosic ethanol. Cellulosic biofuels, such as cellulosic ethanol, began to be produced in commercial-scale plants in 2013. These fuels are made from cellulose-containing organic material. Cellulose forms the primary structural component of green plants and is by far the most abundant organic (carbon-containing) compound on Earth. The primary cell wall of green plants is made primarily of cellulose; the secondary wall contains cellulose with variable amounts of lignin. Lignin and cellulose, considered together, are termed lignocellulose, which (as wood) is the most common biopolymer on Earth. According to a joint research agenda conducted through the US Department of Energy, the fossil energy ratios (FER) for cellulosic ethanol, corn ethanol, and gasoline are 10.3, 1.36, and 0.81, respectively (Brinkman et al. 2005; Farrell et al. 2006). Cellulosic biomass, derived from non-food sources, such as trees and grasses, is also being developed as a feedstock for ethanol production. Even dry ethanol has roughly one-third lower energy content per unit of volume compared to gasoline, so larger (therefore heavier) fuel tanks are required to travel the same distance, or more fuel stops are required. Biobutanol. Butanol can be produced from biomass (as "biobutanol")as well as fossil fuels (as "petrobutanol"); but biobutanol and petrobutanol have the same chemical properties. Butanol may be used as a fuel in an internal combustion engine. Because its longer hydrocarbon chain causes it to be fairly non-polar, it is more similar to gasoline than it is to ethanol. Butanol has been demonstrated to work in vehicles designed for use with gasoline without modification, and is thus often claimed to provide a direct replacement for gasoline (in a similar way to biodiesel in diesel engines). Biobutanol has the advantage in combustion engines in that its energy density is closer to gasoline than the simpler alcohols (while still retaining over 25% higher octane rating); however, biobutanol is currently more difficult to produce than ethanol or methanol. Biomethanol. Most methanol (the simplest alcohol) is produced from natural gas, a nonrenewable fossil fuel, and modern methanol also is produced in a catalytic industrial process directly from carbon monoxide, carbon dioxide, and hydrogen. However, methanol also can be produced from biomass (as biomethanol) using very similar chemical processes. Biodiesel is made from vegetable oils and animal fats. Biodiesel can be used as a fuel for diesel-engine vehicles in its pure form, but it is usually used as a diesel additive to reduce levels of particulates, carbon monoxide, and hydrocarbons from diesel-powered vehicles. Biodiesel is produced from oils or fats using transesterification and is the most common biofuel in Europe. Biogas, which is also known as biomethane, landfill gas, swamp gas, and digester gas, is a collection of gases (largely methane and carbon dioxide) produced by the anaerobic degradation of biomass (non-fossil organic matter) by various bacteria. The primary component of biogas is methane gas, which comprises 50-90% by volume of biogas. Usually, biogas is 50% to 80% methane and 20% to 50% carbon dioxide, with the remainder such trace gases as hydrogen, carbon monoxide, and nitrogen. Methane also is the primary component of natural gas, but natural gas normally is recovered with more than 70% methane, along with other hydrocarbons (such as butane and propane) and traces of carbon dioxide and other chemicals. Natural gas is processed so that it is almost entirely, 98%, methane. Bioigas is produced in a variety of low-oxygen natural environments with degradable organic matter, including swamps, marshes, landfills, agricultural and other waste (sewage sludge, manure, waste lagoons), aquatic sediments, wet soils, buried organic matter, as well as via enteric fermentation in some animal digestive tracts, notably in cattle (Wilkie 2013). Biogas technology allows it to be recovered using sealed vessels and therefore available for heating, electrical generation, mechanical power, and so forth. 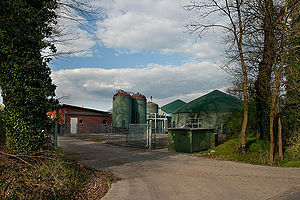 Biogas can be retrieved from garbage or mechanical biological treatment waste processing systems. The solid byproduct, digestate, can be used as a biofuel or a fertilizer. Like natural gas, biogas has a low volumetric energy density compared to liquid biofuels, but it can be purified to a natural gas equivalent and further compressed for use as a transportation fuel, substituting for natural gas. (Natural gas also is compressed to CNG, in order to be used to power motor vehicles.) Methane is also suitable for use in fuel cell generators. Biogas is often made from wastes, but also is made from biomass energy feedstocks (Wilkie 2013). Landfill gas cannot be distributed through utility natural gas pipelines unless it is cleaned up to less than 3 per cent CO2, and a few parts per million H2S, because these chemicals corrode the pipelines. Biogas is a renewable energy source, like solar and wind energy. Furthermore, biogas can be produced from regionally available raw materials such as recycled waste and is environmentally friendly. More than half of the gas used in Sweden to power the natural gas vehicles is biogas (Wilkie 2013). In the United Kingdom, biogas is estimated to have the potential to replace around 17% of vehicle fuel. Algae biofuels. Algae fuel is a biofuel that is derived from algae. Algae are photosynthetic, eukaryotic, plant-like organisms that use chlorophyll in capturing light energy, but lack characteristic plant structures such as leaves, roots, flowers, vascular tissue, and seeds. The production of algae to harvest oil for biofuels has not yet been undertaken on a commercial scale. But algae potentially can be grown commercially in environments such as algae ponds at wastewater treatment plants and the oil extracted from the algae and processed into biofuels. The benefits of algal biofuel are that it can be produced industrially, thereby obviating the use of arable land and food crops (such as soy, palm, and canola), and that it has a very high oil yield as compared to all other sources of biofuel. Thus, algaculture, unlike food crop-based biofuels, does not entail a decrease in food production, since it requires neither farmland nor fresh water. Seaweeds, which are macroscopic, multicellular marine algae, may offer a particular useful source of biofuels, since they lack lignin and likewise do not require land, fresh water, or fertilizer. One complication is that since about one-third of the sugars in seaweed take the form of alginate and microbes have not been able to convert it into ethanol. However, in 2012, scientists reported that they have genetically engineered a strain of Escherichia coli to break down and ferment alginate in seaweed which could allow greater production (Stokstad 2012). Lignocellulose biofuels. Lignocellulose is composed of cellulose, hemicellulose, and lignin and makes up the structural material in plants, including in wood, grasses, water plants, and other rigid plant structures. When corn, wheat, and other plant crops are processed, tons of the stalks, stems, and wood shavings are disposed of because these waste parts contain lignocellulose and are inedible and have been difficult to turn into biofuel. However, much research is being conducted in how to turn such waste items into biofuels. Above, cellulosic ethanol was mentioned as one byproduct of converting cellulosic biomass. Other research is being conducted because lignocellulose offers an alternative to fossil fuels (Eberly 2013). Jatropha biofuels. Several groups are conducting research on Jatropha curcas, a poisonous shrub-like tree that produces seeds considered by many to be a viable source of biofuels feedstock oil (Divakara et al. 2010). Much of this research focuses on improving the overall per acre oil yield of Jatropha through advancements in genetics, soil science, and horticultural practices. Biogasoline. Biogasoline is gasoline produced from biomass such as algae. Like traditionally produced gasoline, it contains between 6 (hexane) and 12 (dodecane) carbon atoms per molecule and can be used in internal-combustion engines. Biogasoline is chemically different from biobutanol and bioethanol, as these are alcohols, not hydrocarbons. Vegetable oil. Straight unmodified edible vegetable oil is generally not used as fuel, but lower-quality oil can and has been used for this purpose. Used vegetable oil is increasingly being processed into biodiesel, or (more rarely) cleaned of water and particulates and used as a fuel. Vegetable oil is an alternative fuel for diesel engines and for heating oil burners. For engines designed to burn diesel fuel, the viscosity of vegetable oil must be lowered to allow for proper atomization of the fuel, otherwise incomplete combustion and carbon build up will ultimately damage the engine. Fungi biofuels. A group at the Russian Academy of Sciences in Moscow, in a 2008 paper, stated they had isolated large amounts of lipids from single-celled fungi and turned it into biofuels in an economically efficient manner. More research on this fungal species, Cunninghamella japonica, and others, is likely to appear in the near future (Sergeeva et al. 2008). The recent discovery of a variant of the fungus Gliocladium roseum points toward the production of so-called myco-diesel from cellulose. This organism was recently discovered in the rainforests of northern Patagonia, and has the unique capability of converting cellulose into medium-length hydrocarbons typically found in diesel fuel (Strobel et al. 2008). Animal gut bacteria for production of biofuels. Microbial gastrointestinal flora in a variety of animals have shown potential for the production of biofuels. Recent research has shown that TU-103, a strain of Clostridium bacteria found in Zebra feces, can convert nearly any form of cellulose into butanol fuel (Hobgood Ray 2011). Microbes in panda waste are being investigated for their use in creating biofuels from bamboo and other plant materials (Handwerk 2013). Waste-to-energy (WtE) or energy-from-waste (EfW) is the process of generating energy in the form of electricity and/or heat from the incineration of waste. Most WtE processes produce electricity and/or heat directly through combustion, or produce a combustible fuel commodity, such as methane, methanol, ethanol or synthetic fuels. The generation of energy by the use of biomass waste can make a significant contribution to a national renewable energy. In the United States, biomass waste rates fourth among renewable energy sources for utility-scale electricity generation after hydroelectric power (56%), wind (28%), and biomass wood (8%), with a 4% share(EIA 2018). Most of this biomass waste is municipal solid waste burned as fuel to run power plants (EIA 2018). Incineration, the combustion of organic material such as waste with energy recovery, is the most common WtE implementation. Modern incineration plants are vastly different from old types, some of which neither recovered energy nor materials. Modern incinerators reduce the volume of the original waste by 95-96 percent, depending upon composition and degree of recovery of materials such as metals from the ash for recycling. Among criticisms of the generation of energy via biomass waste are the emission of fine particulate matter. Incineration of waste in general also has the complications of emission of heavy metals, trace dioxin, and acid gas, and critics argue that incinerators destroy valuable resources and they may reduce incentives for recycling. Wood has been used as a popular fuel for millennia. Today, this hard, fibrous structural tissue found in the stems and roots of trees and other woody plants can be classified as an alternative energy to fossil fuels. Wood fuel may be available as firewood, charcoal, chips, sheets, pellets, and sawdust. Wood fuel can be used for cooking and heating, and occasionally for fueling steam engines and steam turbines that generate electricity. Wood may be used indoors in a furnace, stove, or fireplace, or outdoors in a furnace, campfire, or bonfire. In many areas, wood is the most easily available form of fuel, requiring no tools in the case of picking up dead wood, or few tools, although as in any industry, specialized tools, such as skidders and hydraulic wood splitters, have been developed to mechanize production. Sawmill waste and construction industry by-products also include various forms of lumber tailings. 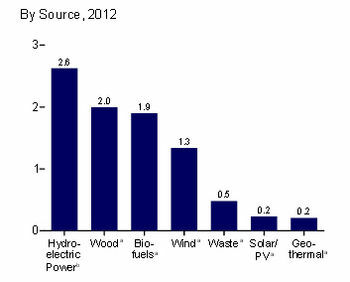 Wood remains the largest biomass energy source. In terms of its use for utility-scale electricity generation, in the United States, it rates among renewable energy sources after hydroelectric power (56%) and wind (28%), with biomass wood responsible for an 8% share of renewable-generated electricity (EIA 2018). In the United States, most of the electricity from wood biomass is produced at lumber and paper mills, which use their own wood waste to provide their own electricity and steam needs (EIA 2018). Charcoal is a derivative of wood. Biomass briquettes are being developed in the developing world as an alternative to charcoal. The technique involves the conversion of almost any plant matter into compressed briquettes that typically have about 70% the calorific value of charcoal. There are relatively few examples of large scale briquette production. One exception is in North Kivu, in eastern Democratic Republic of Congo, where forest clearance for charcoal production is considered to be the biggest threat to Mountain Gorilla habitat. The staff of Virunga National Park have successfully trained and equipped over 3500 people to produce biomass briquettes, thereby replacing charcoal produced illegally inside the national park, and creating significant employment for people living in extreme poverty in conflict affected areas (Otti 2016). As with any fire, burning wood fuel creates numerous by-products, some of which may be useful (heat and steam), and others that are undesirable, irritating, or dangerous. Among the deleterious by-products are smoke, containing water vapor, carbon dioxide and other chemicals and aerosol particulates, including caustic alkali fly ash, which can be an irritating (and potentially dangerous) by-product of partially burnt wood fuel. A major component of wood smoke is fine particles that may account for a large portion of particulate air pollution in some regions. Tidal energy is the form of energy created by movement of tides. Tidal forces are periodic variations in gravitational attraction exerted by celestial bodies. These forces create corresponding motions or currents in the world's oceans. Due to the strong attraction to the oceans, a bulge in the water level is created, causing a temporary increase in sea level. When the sea level is raised, water from the middle of the ocean is forced to move toward the shorelines, creating a tide. This occurrence takes place in an unfailing manner, due to the consistent pattern of the moon’s orbit around the Earth (DiCerto 1976). In terms of alternative energy, tidal energy refers to the energy that is harnessed from the tides for practical purposes. The term tidal power is used synonymously as the conversion of tidal energy into a useful form of energy, or more specifically as the generation of electricity from the tides. Tidal power is the only technology that draws on energy inherent in the orbital characteristics of the Earth–Moon system, and to a lesser extent in the Earth–Sun system. Tidal power may be considered a form of hydropower whereby the definition of hydropower is expanded to encompass any type of energy gained from the movement of water. Because the Earth's tides are ultimately due to gravitational interaction with the Moon and Sun and the Earth's rotation, tidal power is practically inexhaustible and classified as a renewable energy resource. Although not yet widely used, tidal power has potential for future electricity generation. Tides are more predictable than wind energy and solar power. Among sources of renewable energy, tidal power has traditionally suffered from relatively high cost and limited availability of sites with sufficiently high tidal ranges or flow velocities, thus constricting its total availability. However, many recent technological developments and improvements, both in design (e.g. dynamic tidal power, tidal lagoons), and turbine technology (e.g. new axial turbines, cross flow turbines), indicate that the total availability of tidal power may be much higher than previously assumed, and that economic and environmental costs may be brought down to competitive levels. Wave energy is the transport of energy by ocean surface waves. Waves are generated by wind passing over the surface of the sea. As long as the waves propagate slower than the wind speed just above the waves, there is an energy transfer from the wind to the waves. Both air pressure differences between the upwind and the lee side of a wave crest, as well as friction on the water surface by the wind, making the water to go into the shear stress causes the growth of the waves (Phillips 1977). Wave height is determined by wind speed, the duration of time the wind has been blowing, fetch (the distance over which the wind excites the waves), and by the depth and topography of the seafloor (which can focus or disperse the energy of the waves). A given wind speed has a matching practical limit over which time or distance will not produce larger waves. In general, larger waves are more powerful but wave power is also determined by wave speed, wavelength, and water density. As an alternative energy, wave energy is the capture of the energy of waves for a useful purpose, such as electricity generation, water desalination, or the pumping of water (into reservoirs). Wave power is used synonymously with wave energy, or references the generation of electricity from the energy of waves. As with tidal power, wave power may be considered a form of hydropower whereby the definition of hydropower is expanded to encompass any type of energy gained from the movement of water. Wave power is distinct from the diurnal flux of tidal power and the steady gyre of ocean currents. Wave-power generation is not currently a widely employed commercial technology, although there have been attempts to use it since at least 1890 (Miller 2004). In 2008, the first experimental wave farm was opened in Portugal, at the Aguçadoura Wave Park. The major competitor of wave power is offshore wind power. Hydrogen fuel is a zero-emission fuel, which uses electrochemical cells, or combustion in internal engines to power vehicles and electric devices. It is also used in the propulsion of spacecraft and can potentially be mass-produced and commercialized for passenger vehicles and aircraft. It is a completely clean burning fuel in that its only by-product is water (Hijikata 2001). As the first element on the periodic table, hydrogen is the lightest element on earth. Since hydrogen gas is so light, it rises in the atmosphere and is therefore rarely found in its pure form, H2 (Altork and Busby 2010). In a flame of pure hydrogen gas, burning in air, the hydrogen (H2) reacts with oxygen (O2) to form water (H2O) and releases heat. Other than water, hydrogen combustion may yield small amounts of nitrogen oxides. Combustion heat enables hydrogen to act as a fuel. Nevertheless, hydrogen is an energy carrier (i.e. a store for energy first generated by other means), like electricity, not an energy resource (FSEC 2007). Energy firms must first produce the hydrogen gas, and that production induces environmental impacts (Zehner 2012). Hydrogen production always requires more energy than can be retrieved from the gas as a fuel later on (Zehner 2012). This is a limitation of the physical law of the conservation of energy. Because pure hydrogen does not occur naturally, it takes a substantial amount of energy to manufacture it. There are different ways to manufacture it, such as, electrolysis and steam-methane reforming process. Once manufactured, this energy carrier can be delivered to fuel cells and generate electricity and heat, or burned to run a combustion engine. Hydrogen fuel can provide motive power for cars, boats and airplanes, portable fuel cell applications, or stationary fuel cell applications, which can power an electric motor. In each case hydrogen is combined with oxygen to form water. Because the process requires a high-energy input, commercial hydrogen is very inefficient (Ghirardi et al. 1997). Use of a biological vector as a means to split water, and therefore produce hydrogen gas, would allow for the only energy input to be solar radiation. Biological vectors can include bacteria or more commonly algae. This process is known as biological hydrogen production (Radmer and Kok 1977). It requires the use of single celled organisms to create hydrogen gas through fermentation. Without the presence of oxygen, also known as an anaerobic environment, regular cellular respiration cannot take place and a process known as fermentation takes over. A major by-product of this process is hydrogen gas. If we could implement this on a large scale, then we could take sunlight, nutrients, and water and create hydrogen gas to be used as a dense source of energy (Gaffron and Rubin 1942). Large-scale production has proven difficult. In 1999 it was reported that these anaerobic conditions were induced by sulfur deprivation (Melis et al. 1999). Since the fermentation process is an evolutionary back up, turned on during stress, the cells would die after a few days. In 2000, a two-stage process was developed to take the cells in and out of anaerobic conditions and therefore keep them alive (Melis and Happe 2001). Finding a way to produce hydrogen for energy on a large-scale has been the main goal of research. Careful work is being done to ensure an efficient process before large-scale productionl however once a mechanism is developed, this type of production could address energy needs in a substantial way (Doebbe et al. 2007). Over $1 billion of federal money has been spent on the research and development of hydrogen fuel in the United States (Wise 2006). Since the late 1980s, there have been several attempts to investigate the possibility of harvesting energy from lightning. While a single bolt of lightning carries a relatively large amount of energy (approximately 5 billion joules (IOP 2014), this energy is concentrated in a small location and is passed during an extremely short period of time (milliseconds); therefore, extremely high electrical power is involved (Williams 1988). It has been proposed that the energy contained in lightning be used to generate hydrogen from water, or to harness the energy from rapid heating of water due to lightning (Knowledge 2007), or to use inductors spaced far enough away so that a safe fraction of the energy might be captured (Helman 2011). A technology capable of harvesting lightning energy would need to be able to rapidly capture the high power involved in a lightning bolt. Several schemes have been proposed, but the ever-changing energy involved in each lightning bolt have rendered lightning power harvesting from ground based rods impractical. Additionally, lightning is sporadic, and therefore energy would have to be collected and stored; it is difficult to convert high-voltage electrical power to the lower-voltage power that can be stored. Another major challenge when attempting to harvest energy from lightning is the impossibility of predicting when and where thunderstorms will occur. Even during a storm, it is very difficult to tell where exactly lightning will strike (IOP 2014). 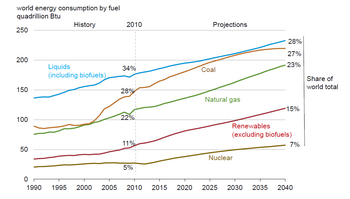 Historical and projected world energy use by energy source, 1990-2035, Source: International Energy Outlook 2011, EIA. Nuclear binding energy is the energy required to split a nucleus of an atom into its component parts. The term nuclear binding energy may also refer to the energy balance in processes in which the nucleus splits into fragments composed of more than one nucleon. If new binding energy is available when light nuclei fuse, or when heavy nuclei split, either of these processes result in releases of the binding energy. This energy, available as nuclear energy, can be used to produce electricity (nuclear power) or as a nuclear weapon. An absorption or release of nuclear energy occurs in nuclear reactions or radioactive decay; those that absorb energy are called endothermic reactions and those that release energy are exothermic reactions. Energy is consumed or liberated because of differences in the nuclear binding energy between the incoming and outgoing products of the nuclear transmutation. Nuclear energy or nuclear power is the use of exothermic nuclear process of nuclear binding energy to generate useful heat and electricity. The term includes nuclear fission, nuclear decay, and nuclear fusion. Presently the nuclear fission of elements in the actinide series of the periodic table produce the vast majority of nuclear energy in the direct service of humankind, with nuclear decay processes, primarily in the form of geothermal energy, and radioisotope thermoelectric generators, in niche uses making up the rest. In 2014, the IAEA reported that there are 438 operational nuclear power reactors and 71 under construction (IAEA 2013). France, Belgium and Slovakia use them as the primary source of electricity, with France using its 58 operating nuclear reactors to produce 75% of its electricity. The operational reactors are found in 31 countries and some countries will be starting their first nuclear power plants, including: Belarus, Vietnam, Turkey, United Arab Emirates, Jordan, Ghana, Morocco and Saudi Arabia. In addition, there are approximately 140 naval vessels using nuclear propulsion in operation, powered by some 180 reactors (EG 2012; WNA 2014). Nuclear (fission) power stations, excluding the contribution from naval nuclear fission reactors, provided about 5.7% of the world's energy and 13% of the world's electricity in 2012 (IEA 2012). Nuclear energy is generally not considered to belong to the category of renewable energy, although in 1983 Bernard Cohen proposed that uranium could be considered a renewable source of energy. This he based on the fact that it is effectively inexhaustible, and fast breeder reactors fueled by naturally replenished uranium taken from seawater could supply energy as long as the Sun's expected lifespan (Gritsevskyi 2008). Wood has been used as fuel for millennia. The discovery of how to make fire for the purpose of burning wood is regarded as one of humanity's most important advances. The use of wood as a fuel source for heating is much older than civilization and is assumed to have been used by Neanderthals. Historically, it was limited in use only by the distribution of technology required to make a spark. Wood heat is still common throughout much of the world. Early examples include the use of wood heat in tents. Fires were constructed on the ground, and a smoke hole in the top of the tent allowed the smoke to escape by convection. "Europeans had lived in the midst of vast forests throughout the earlier medieval centuries. After 1250 they became so skilled at deforestation that by 1500 C.E. they were running short of wood for heating and cooking... By 1500 Europe was on the edge of a fuel and nutritional disaster, [from] which it was saved in the sixteenth century only by the burning of soft coal and the cultivation of potatoes and maize." Coal would gain increase prominence during the industrial revolution in the late eighteenth century (Clark and Jacks 2007). While some historians consider coal only a "bit actor," other economic historians assert "coal was indeed at the heart of the Industrial Revolution," the "key transformative element of the Industrial Revolution," and that the "switch from a self-sustaining organic economy to a mineral resource depleting inorganic economy was central to the British Industrial Revolution" (Clark and Jacks 2007). In the early nineteenth century, whale oil was the dominant form of lubrication and fuel for lamps, but the depletion of the whale stocks by mid century caused whale oil prices to skyrocket setting the stage for the adoption of petroleum, which was first commercialized in Pennsylvania in 1859. Already the foundation for alcohol to serve as an alternative to fossil fuels was laid in 1917, when Alexander Graham Bell advocated ethanol from corn, wheat, and other foods as an alternative to coal and oil, stating that the world was in measurable distance of depleting these fuels. For Bell, the problem requiring an alternative was lack of renewability of orthodox energy sources (Bell 1917). Since the 1970s, Brazil has had an ethanol fuel program, which has allowed the country to become the world's second largest producer of ethanol (after the United States) and the world's largest exporter. The pursuit of nuclear energy for electricity generation began soon after the discovery in the early twentieth century that radioactive elements, such as radium, released immense amounts of energy, according to the principle of mass–energy equivalence. However, means of harnessing such energy was impractical, because intensely radioactive elements were, by their very nature, short-lived. This situation, however, changed in the late 1930s, with the discovery of nuclear fission. The first man-made reactor, known as Chicago Pile-1, achieved critical mass on December 2, 1942. This work became part of the Manhattan Project, which made enriched uranium and built large reactors to breed plutonium for use in the first nuclear weapons. Electricity was generated for the first time by a nuclear reactor on December 20, 1951, at the EBR-I experimental station near Arco, Idaho. On June 27, 1954, the USSR's Obninsk Nuclear Power Plant became the world's first nuclear power plant to generate electricity for a power grid. The world's first commercial nuclear power station, Calder Hall at Windscale, England, was opened in 1956. The first commercial nuclear generator to become operational in the United States was the Shippingport Reactor (Pennsylvania, December 1957). ↑ U.S. Environmental Protection Agency (EPA), "Glossary of climate change terms," US Environmental Protection Agency. Retrieved April 21, 2018. ↑ Intergovernmental Panel on Climate Change (IPCC), "Appendix II Glossary," IPCC Third Assessment Report Working Group III: Mitigation (2001). Retrieved April 21, 2018. ↑ Collins English Dictionary, "Alternative energy," Collins English Dictionary, 10th Edition. Retrieved April 21, 2018, from Dictionary.com. ↑ Random House Dictionary, "Alternative energy," Random House Dictionary (2016). Retrieved April 21, 2018, from Dictionary.com. ↑ WordNet, "Alternative energy," WordNet. Retrieved April 21, 2018. ↑ Alexander Graham Bell (1917) wrote: "In relation to coal and oil, the world's annual consumption has become so enormous that we are now actually within measurable distance of the end of the supply. What shall we do when we have no more coal or oil! .... There is, however, one other source of fuel supply which may perhaps this problem of the future. Alcohol makes a beautiful, clean and efficient fuel, and where not intended for human consumption can be manufactured very cheaply from corn stalks and in fact from almost any vegetable matter capable of fermentation. Altork, L. N., and J. R. Busby. Hydrogen fuel cells: Part of the solution. Technology & Engineering Teacher 70(2) (2010): 22-27. Bell, A. G. "Prizes for the inventor: Some of the problems awaiting solution". National Geographic Magazine January 1917: 131-162. Retrieved April 21, 2018. Brinkman, N., M. Wang, T. Weber, and T. Darlington. Well-to-wheels analysis of advanced/vehicle systems: A North American study of energy use, greenhouse gas emissions, and criteria pollutant emissions. Office of Energy Efficiency & Renewable Energy, 2005. Retrieved April 21, 2018. Butti, K., and J. Perlin. A Golden Thread: 2500 Years of Solar Architecture and Technology. Van Nostrand Reinhold, 1981. ISBN 0442240058. Cantor, N. F. The Civilization of the Middle Ages: The Life and Death of a Civilization. Harper Collins, 1993. ISBN 978-0060925536. Clark, G., and D. Jacks. Coal and the industrial revolution, 1700-1869. European Review of Economic History, 2007. Retrieved April 21, 2018. DiCerto, J. J. The Electric Wishing Well: The Solution to the Energy Crisis. New York: Macmillan, 1976. ISBN 0025313207. Divakara, B. N., H. D. Upadhyaya, S. P. Wani, and C. L. Laxmipathi Gowda. Biology and genetic improvement of Jatropha curcas L.: A review. Applied Energy 87(3) (2010): 732–742. Doebbe, A., J. Rupprecht, J. Beckmann, J. H. Mussgnug, A. Hallmann, B. Hankamer, and O. Kruse. Functional integration of the HUP1 hexose symporter gene into the genome of C. reinhardtii: Impacts on biological H2 production. Journal of Biotechnology 131 (2007): 27–33. PMID 17624461. Elliott, D. L., L. L. Wendell, and G. L. Gower. Wind energy potential in the United States considering environmental and land use exclusions. In M. E. Ardan, S. M. A. Burley, and M. Coleman, Proceedings of the Biennial Congress of the International Solar Energy Society. Oxford, UK: Pergamon, 1992. Elliott, D. Energy, Society, and Environment: Technology for a Sustainable Future. New York: Routledge, 1997. ISBN 0415145066. Engineers Garage (EG). Nuclear power plants & nuclear reactors. EngineersGarage.com, 2012. Retrieved April 21, 2018. Farrell, A. E., R. J. Plevin, B. T. Turner, et al. Ethanol can contribute to energy and environmental goals. Science 311 (2006): 506-8. Florida Solar Energy Center (FSEC). Hydrogen basics. Florida Solar Energy Center. Retrieved April 21, 2018. Gaffron, H., and J. Rubin. Fermentative and photochemical production of hydrogen in algae. Journal of General Physiology 26 (1942): 219–240. PMID 19873339. Ghirardi, M. L., R. K. Togasaki, and M. Seibert. Oxygen sensitivity of algal H2-production. ''Applied Biochemistry and Biotechnology 63 (1997): 141–51. PMID 18576077. Green Power Partnership. What Is Green Power? Environmental Protection Agency, 2013. Retrieved April 21, 2018. Gritsevskyi, A. Renewable vs. non-renewable energy sources, forms and technologies. 13th Meeting of the London Group on Environmental Accounting: September 29- October 3, 2008, Brussels, Belgium. Retrieved April 21, 2018. Hammerschlag, R. Ethanol's energy return on investment: A survey of the literature 1999-Present. Environ. Sci. Technol 40 (2006): 1744-50. Handwerk, B. Panda poop might help turn plants into fuel. National Geographic Daily News September 10, 2013. Retrieved April 21, 2018. Helman, D. S. Catching lightning for alternative energy. Renewable Energy 36 (2011): 1311–1314. Retrieved April 21, 2018. Hijikata, T. Research and development of international clean energy network using hydrogen energy. International Journal of Hydrogen Energy 27 (2001): 115-129. Hobgood Ray, K. Cars could run on recycled newspaper, Tulane scientists say. Tulane University August 25, 2011. Retrieved April 23, 2018. Hoffert, M. I., et al. Advanced technology paths to global climate change stability: Energy for a greenhouse planet. Science 298 (2002): 981-987. Horton, J., and P. J. Kiger. 10 wacky forms of alternative energy. how Stuff Works. Retrieved April 23, 2018. Huesemann, M. H., and J. A. Huesemann. Technofix: Why Technology Won’t Save Us or the Environment. Retrieved April 23, 2018. New Society Publishers, 2011. ISBN 0865717044. Institute of Physics (IOP). Could you power a city with lightning? Physics.org., 2014. Retrieved November 16, 2016. Intergovernmental Panel on Climate Change (IPCC). Appendix II Glossary. IPCC Third Assessment Report Working Group III: Mitigation, 2001. Retrieved April 23, 2018.
International Atomic Energy Agency (IAEA) The Database on Nuclear Power Reactors. PRIS: Power Reactor Information System, 2014. Retrieved April 23, 2018.
International Energy Agency (IEA). Solar energy perspectives: Executive summary. International Energy Agency, 2011. Retrieved April 23, 2018.
International Energy Agency (IEA). Key World Energy Statistics 2017. IEA, 2017. Retrieved April 23, 2018. Knowledge ("Dr. Knowledge"). Why can't we capture lightning and convert it into usable electricity? Boston Globe, October 29, 2007. Retrieved April 23, 2018. Melis, A., and T. Happe. Hydrogen production. Green algae as a source of energy. Plant Physiology 127(3) (2001): 740-8. PMID 11706159. Retrieved April 23, 2018. Melis, A., J. Neidhardt, and J. R. Benemann. Dunaliella salina (Chlorophyta) with small chlorophyll antenna sizes exhibit higher photosynthetic productivities and photon use efficiencies than normally pigmented cells. Journal of Applied Physiology 10 (1999): 515–52. Miller, C. A brief history of wave and tidal energy experiments in San Francisco and Santa Cruz. Outsidelands.org, 2004. Retrieved Aprl 23, 2018. Nakicenovic, N., A. Gruebler, and A. McDonald. Global Energy Perspective. Cambridge University Press, 1998. ISBN 0521642000. Pearson, R.J., Eisaman, M.D., et al. "Energy Storage via Carbon-Neutral Fuels Made From CO2, Water, and Renewable Energy". Proceedings of the IEEE 100(2) (2012): 440–60. Penn State Eberly College of Science. Innovation across the disciplines: Alternative energy. Science Journal June 2013: 20-27. Phillips, O. M. The Dynamics of the Upper Ocean, 2nd ed.. Cambridge University Press, 1977. ISBN 0521298016. Pimentel, D., et al. Achieving a secure energy future: Environmental and economic issues. Ecological Economics 9 (1994):201-219. Radmer, R., and B. Kok. Photosynthesis: Limited yields, unlimited dreams. BioScience 29 (1977): 599–605. Rojstaczer, S., S. M. Sterling, and N. J. Moore. Human appropriation of photosynthesis products. Science 294 (2001): 2549-2552. Royal Society of Chemistry (RSC). Solar photovoltaics & solar fuels. Royal Society of Chemistry, 2014. Retrieved April 23, 2018. Ryback, L. Geothermal sustainability. GHC Bulletin 28(3) (2007): 2–6. Retrieved April 23, 2018. Sawin, J. L., E. Martinot, et al. Renewables 2011: Global Status Report. Renewable Energy Policy Network for the 21st Century (REN21), 2011. Retrieved April 23, 2018. Scheer, H. The Solar Economy. Earthscan Publications, 2002. ISBN 1844070751. Sergeeva, Y. E., L. A. Galanina, D. A. Andrianova, and E. P. Feofilova. Lipids of filamentous fungi as a material for producing biodiesel fuel. Applied Biochemistry and Microbiology 44(5) (2008): 523. Siegel, R. P. Wind power: Pros and cons. TriplePundit.com, 2012. Retrieved April 23, 2018. Smil, V. General Energetics: Energy in the Biosphere and Civilization. Wiley, 1991. ISBN 0471629057. Smil, V. Energy at the Crossroads. Organisation for Economic Co-operation and Development, 2006. ISBN 0262194929. Smith, Z. A., and K. D. Taylor. Renewable and Alternative Energy Resources. Santa Barbara, CA: ABC-CLIO, 2008. ISBN 9781598840896. Stokstad, E. Engineered superbugs boost hopes of turning seaweed into fuel. Science 335 (2012): 273. Strobel, G., B. Knighton, K. Kluck, Y. Ren, T. Livinghouse, M. Griffin, D. Spakowicz, and J. Sears. The production of myco-diesel hydrocarbons and their derivatives by the endophytic fungus Gliocladium roseum (NRRL 50072). Microbiology 154(Pt 11) (2008): 3319–3328. PMID 18957585. United States Department of Energy (USDOE). The history of solar. Dept. of Energy. Retrieved April 21, 2018. United States Energy Information Administration (EIA). U.S. has large geothermal resources, but recent growth is slower than wind or solar. Energy Information Administration, 2011. Retrieved April 21, 2018. United States Energy Information Administration (EIA). Electricity in the United States is produced with diverse energy sources and technologies. EIA, 2018. Retrieved April 21, 2018. United States Energy Information Administration (EIA). Solar explained, 2017. EIA. Retrieved April 21, 2018. United States Environmental Protection Agency (EPA). Glossary of climate change terms. US Environmental Protection Agency, 2016. Retrieved April 21, 2018. Vitousek, P. M., P. R. Ehrlich, A. H. Ehrlich, and P. A. Matson. Human appropriation of the products of photosynthesis. BioScience 36(6) (1986): 368-373. Wilkie, A. C. What is biogas?. Soil and Water Science Department, University of Florida, 2018. Retrieved April 21, 2018. Williams, E. R. The electrification of thunderstorms. Scientific American November 1988: 88–99. Wise, J. The truth about hydrogen. Popular Mechanics November 1, 2006. Retrieved April 21, 2018. World Nuclear Association (WNA). Nuclear-powered ships. World-nuclear.org, 2017. Retrieved April 21, 2018. Worldwatch Institute. 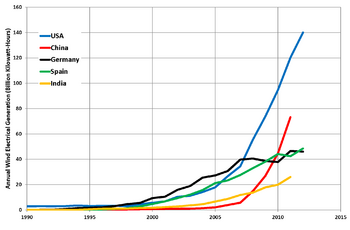 Use and capacity of global hydropower increases. Worldwatch, 2013. Retrieved April 21, 2018. Worldwatch. Biofuels make a comeback despite tough economy. Worldwatch Institute, 2011. Retrieved April 21, 2018. Wuestenhagen, R., M. Welsink, and M. J. Buerer. Social acceptance of renewable energy innovations: An introduction to the concept. Energy Policy 35 (2007): 2683-2691. Zehner, O. Green Illusions. Retrieved April 21, 2018. Lincoln: University of Nebraska Press, 2012. ISBN 978-0803237759. All links retrieved April 21, 2018. This page was last modified on 23 April 2018, at 22:43.